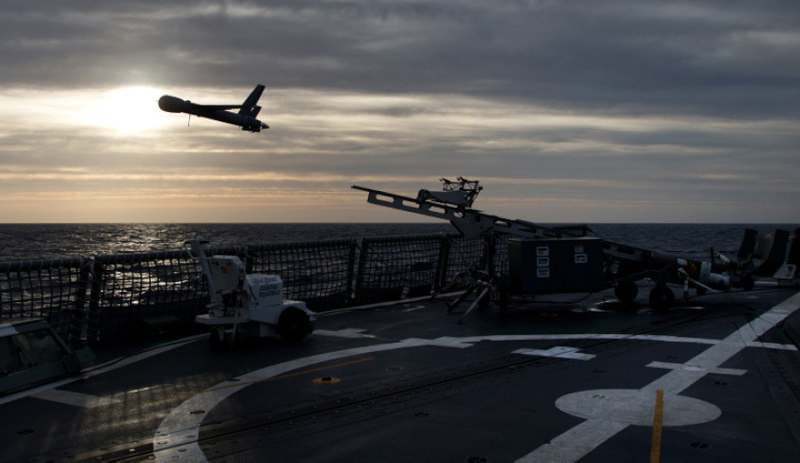 Scan Eagle, an unmmanned aerial vehicle launches from the flight deck of HMAS Newcastle during operational evaluation trials. Image via Commonwealth of Australia, Department of Defence. As Australia’s defence innovation community undergoes a once-in-a-generation reform, calls are growing for Australia to look at the US Defense Advanced Research Projects Agency (DARPA) and develop its own agency tasked with supporting scientific discovery and the development of new technologies. A new research brief from the United States Studies Centre, authored by the director of the University of Sydney's Quantum Control Laboratory Professor Michael Biercuk, looks at the potential for a DARPA model in Australia, suggesting such a model can only be achieved through significant reform within the Department of Defence to address structural issues that could otherwise produce a gap between expectations and capabilities. In the brief, Professor Biercuk says the US Department of Defense and military plays a central role in supporting scientific discovery and the development of new technologies, whereas Australia currently takes a more civilian-orientated approach. "Although emphasis is placed on the contributions of industry to the domestic technology agenda, the US government frequently acts to underwrite risk, provide early stage support for new ventures, and directly fund private-sector R&D activities," the briefing reads. "Government funding is provided through civilian basic science agencies, but also via an alphabet-soup of agencies within Defense and the intelligence community. The government separates 'in-house' military research labs, such as the Army Research Laboratory, from agencies that focus on funding external projects. These organisations are known as 'Mission Agencies' because they support high-tech R&D outside defence that is focused on military end-user problems, like developing new ways to keep soldiers warm or pack the performance of the most stable atomic clock onto a microchip." The brief suggests Australia's research and development agency Defence Science and Technology (DST) Group should be joined by a standalone DARPA-like agency with three primary characteristics: outward focus, expert rotational technical staffing and broad strategic portfolio separated from operational needs. "The new agency should be dedicated to supporting research by partners in industry, government and academia, rather than supporting internal R&D performed by defence scientists. In line with DARPA, approximately 90 per cent of its budget should be directed to external programs," the briefing reads. "The agency should be staffed by technical experts who can drive new research programs, mitigate stagnation and maintain an ongoing connection between agency management and active researchers. Ideally, rotations with academic and industrial research organisations should be supported, but career public servants may also rotate through the agency and all should incur term limits. "Like DARPA, the agency needs a broad portfolio ranging from basic science and mathematics to tactical technology development, and must be divorced from contemporary operational needs within Defence. This is essential to maintain the long-term vision of such an agency. Segregation of internal R&D missions can mitigate conflicts between near-term military imperatives and long-term strategic initiatives. "A clearly articulated and narrowly scoped vision statement focused on supporting the most forward-thinking R&D activities is essential to ensuring such an agency can flourish. An Australian DARPA needs to focus exclusively on solving problems deemed by technical experts to be important in maintaining a scientific and technological advantage." Professor Biercuk adds that Australia and Defence is already on the way to capitalising on Australia's research and development capabiltiies with the establishment of the $730 million Next Generation Technologies Fund (NGTF), arguing a DARPA model can only enhance the nation's research strength. "The first steps taken in establishing the NGTF put Defence on a pathway to capitalising on domestic research strength," he said. "It is time to complete the journey by implementing the DARPA model in full."